These guys. The Black Keys. I think I may love them, finally. I’ve always had this “No Blues Unless the Singer’s Black or it was From the 20s” policy. That’s probably because my mama raised me on really old blues, bluegrass, country blues and gospel, such as Leadbelly, Robert Johnson and Mississippi John Hurt, Bill Monroe and Marion Williams, Emmylou Harris, The Whites, Ricky Skaggs and of course, my personal hero, Leon Russell. I have this aversion to that really electrified blues. I realize this probably means real music critics think I’m dumb. But hey, I’ve never been to one like something because someone else did. But lo and behold, this week I was bestowed with the Black Keys collection from a friend. And I started at the beginning, with “The Big Come Up,” and despite the fact that I know a lot of these songs from various commercials and TV shows, I gotta hand it to them. They break both rules: They’re white, and definitely not from the 1920s. But they get it, and I think I might have to forever incorporate them into my rotation. And I’m only halfway through their discography. 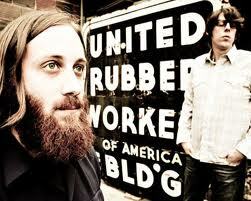 I think I might end up craving the Black Keys, as well as another band I’m just now getting into, Alberta Cross.